Length of day governed by Earth's core processes | Watts Up With That? From the University of Liverpool , something I found interesting because a few years ago, former State Climatologist Jame Goodridge said he saw correlations between length of day and other atmospheric processes. Research at the University of Liverpool has found that variations in the length of day over periods of between one and 10 years are caused by processes in the Earth’s core. The Earth rotates once per day, but the length of this day varies. A yeas, 300million years ago, lasted about 450 days and a day would last about 21 hours. As a result of the slowing down of the Earth’s rotation the length of day has increased. The rotation of the earth on its axis, however, is affected by a number of other factors – for example, the force of the wind against mountain ranges changes the length of the day by plus or minus a millisecond over a period of a year. Professor Richard Holme, from the School of Environmental Sciences, studied the variations and fluctuations in the length of day over a one to 10 year period between 1962 and 2012. The study took account of the effects on the Earth’s rotation of atmospheric and oceanic processes to produce a model of the variations in the length of day on time scales longer than a year. Professor Holme said: “The model shows well-known variations on decadal time scales, but importantly resolves changes over periods between one and 10 years. Previously these changes were poorly characterised; the study shows they can be explained by just two key signals, a steady 5.9 year oscillation and episodic jumps which occur at the same time as abrupt changes in the Earth’s magnetic field, generated in the Earth’s core. The research was conducted in partnership with the Université Paris Diderot and is published in Nature. Gosh, that almost looks like a temperature graph with the AMO. Please, please, please, do not tell that to Mann. He will blame ADLC (Anthro Day Length Change) on CO2 and want to ban fossil fuels so that one side of the earth does not stay faced toward the sun at all times. Imagine, only 7 hours of sleep a day. It would kill me. I believe that anything that ‘plays’ with the Earth, Moon, Sun gravity fields effects on the others causes a modulation ofn the Climate that we see. Gravity is the way that energy is interchanged between non-radiating bodies in an orbital paths. That very slow release of ‘frictional energy’ on the other body that acts as a ‘spring’ to allow the other to get away. I mean, what other way is there to do it? Interesting? It would be interesting to see if there is any relationship between the 60 year LOD cycle and the 60 year PDO cycle. Could ENSO events be due to ‘slopping’ Kelvin waves as well as winds? FAO has used LOD – or at least a model with 55 yr cycles – for temperature (and fish catch) forecasts. I thin you may have to account for what looks like a 24 year cycle as well as 60 years. That would at least split the enregy left to be distributed into more sensible RMS values. Why is the Earth’s rotation and orbital period slowing (over billions of years of course)? Is it due to work between Earth and Solar magnetic fields? … Lief? The force of wind? This sounds to me a bit like blowing on your own sail or trying to hold up a swing with your own hands. A bunch of you who are more learned than I might jump on my conclusion there, and so be it, I won’t argue back. Another point, though, is that while mountain ranges seem big to tiny little creatures like us, on scale with the planet they are hardly there at all. It doesn’t ring true to me that the wind can push the planet around, even by minute amounts. Uh, the Y scale here is in milliseconds, to the human eye it might as well be hours. In other words there isn’t much variation in the length of the day, but this chart make it look like there is. Most of this chart is below average so what does average really mean here? Personally I like have longer days, I can get a lot more done in an extra 4 milliseconds or so. This is another example of research money well spent, if we can figure out a way to get 5 more milliseconds out of the day that would really be something. That’s not be . Take that poster down! “The interaction of magnetic fields”. Indeed. But the magnitudes of energy available are very different. I would call gravity first. So you consider that styudying the minute oscilations, that show up here as variations in the msecs, are in now way connected to that beautfull dance that the orbits show? Most of the change in the length of day is due to the transfer of angular momentum from the earth to the moon due to tidal forces. The moon is accelerated by the tidal bulges into a higher orbit, at the same time the earth’s rotation slows by an equivalent amount to balance the energy. I would expect that settling of heavier elements (Ni and Fe) into the core would tend to counteract the decrease in rotation rate by a lesser amount. I am of course speaking of long-term changes, over the full history of the earth, not short term changes discussed in the article above. Unfortunately, I believe that Anthony has chosen the wrong horse in this case. This parametre is carefully studied by a number of different international organizations including the International Earth Rotation and Reference Systems Service, the Special Bureau for the Atmosphere and the Earth Orientation Centre. Yes, the length of day actually changes and this can be caused by the wind-drag (very short-term), ocean-drag (short-term), moon-gravity-drag (millions of years), core and mantle rotation processes (medium-term), and the gravity from the other planets in the solar system (long-term). I think that the ‘frictional effects’ of Lunar/Earth interaction are underestimated. How the Moon’s gravity ‘plays’ with our Climate by that effect and thus ‘gains’more energy to get away. This cannot possibly be so … ask any old timer (me too) … the days seem to be rocketing by much faster nowadays. Ahhhh, length of day affected by man-made greenhouse gases. Here is the peer reviewed literature. As I said before, we must insist on the science. 🙂 Haaaa haaa. Interesting concentration on short-term variations. However, over longer periods (millions of years) the earth-moon tidal system is more determinative. The moon is observed to move to a higher, more energetic, orbit (about 1 inch/year) as a result of the earth’s rotation/tidal forces. That energy is subtracted from the earth’s rotation, therefore it slows down. Incidentally, that presents a dilemma over a long period. Assuming that Newton’s Laws remain constant, and that the oceans are relatively unchanged, over billions of years, you can back the earth-moon system up. As the moon gets closer, the tidal forces get larger and the process speeds up. Accordingly, about one and a half billion years ago the moon was close enough to cause tides higher than the continental mountains, and the earth is spinning like a top. What’s wrong with this picture? Mainly tidal friction, creating heat which radiates the energy of motion away into space. I expect ocean tides dominate. Needs to be a dissipative force. Perhaps electrical eddy currents could be set up in the core due to magnetic field interactions. That would create resistive heat, which could then radiate away. Somehow, the kinetic energy has to be converted to a form which can be transferred out of the local system. Since plate tectonics began, the earth has been differentiating, with heavier materials sinking toward the core. As a result, the earth should be rotating much faster now, like a spinning skater who pulls their arms closer to their body. It’s obvious the moon’s increasingly higher orbit has counter acted this effect, and has a pronounced effect on the length of day. I would note that the 5.9 year oscillation is almost exactly 1/2 the period of Jupiter around the sun. Don’t know if it MEANS anything, but it is interesting. Oh, it’s a model. 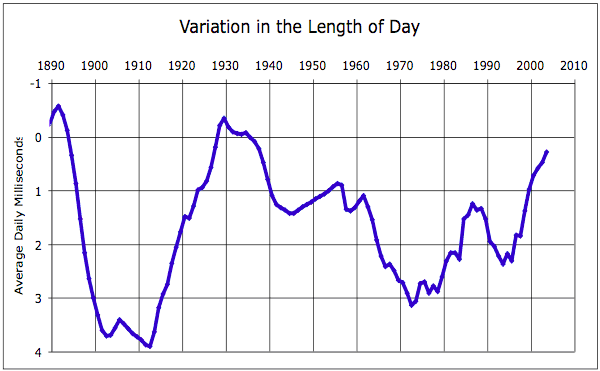 I was wondering how they knew the variation in length of day in 1890—down to fractions of a millisecond. One other (tiny) effect is an annual change caused by snow depositing on higher elevations slightly slowing the rotation rate, which speeds up again when the snow melts. I wonder how much longer the day was during the last ice age. This is why an oil-based economy is such a bad idea. By removing the oil from the Earth, we are taking away the lubricant for all the gears and things in there. When it has all gone, the innards of the Earth will seize up, and the rotation will stop. Then we’ll be really doomed. 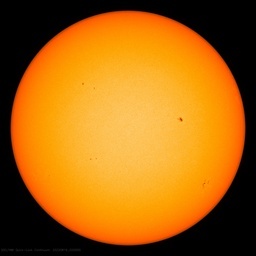 Now didn’t we have a story about the “faint young sun” problem a few days ago? If this is correct “A year, 300million years ago, lasted about 450 days and a day would last about 21 hours. As a result of the slowing down of the Earth’s rotation the length of day has increased.” I wonder what the LOD and year were 3 billion years ago? Sure doesn’t sound like the temperature of the Earth then was determined primarily by CO2. “theoretical calculation of how the Japan earthquake—the fifth largest since 1900—affected Earth’s rotation. His calculations indicate that by changing the distribution of Earth’s mass, the Japanese earthquake should have caused Earth to rotate a bit faster, shortening the length of the day by about 1.8 microseconds (a microsecond is one millionth of a second). Another way to slow the Earth’s rotation is to collect dust and asteroids from space. Tens of thousands of tons of dust hit the earth each year (Internet search found a wide range of numbers, but 50K is representative). Extra mass on the surface has same affect as ice skater holding their arms out: it slows the spin rate. The earth rotates more than 360 degrees per day. The Sun is in the same place East to West each day at the same time, but the earth moves on the orbit so the Sun has to rotate a little more than 360 degrees to put the Sun in the same place. Neat! Makes sense, if you assume the fan is mostly drawing air equally from all sides (radially inward), redirecting it forward, and that flow is then being reflected so that net flow is balanced on the sides, but overall directed backwards. Assuming Lambertian reflection, I get a net backward flow of about 16% max of what it would be if they turned the fan around. You’d probably lose 50% of that from luffing and edge losses, so about 8% relative efficiency overall. That seems about consistent with the speed they got. So, the question becomes, is the “fan” (net atmospheric turnover being powered by the Sun) blowing against surface nonuniformities significant enough to significantly drive LOD. I’m not convinced, but at least you’ve made me slightly more receptive to it. Rod may be correct, but this is supposing that the dust is ‘stationary’. If the dust as it falls is moving at the same speed as the earth’s rotation speed in the relative latitude then the fact that there is added mass at the surface will not affect the rotational speed. More to the point, as the earth heats due to CAGW, the oceans and land will expand outwards. This is where the ‘ice skater’ effect comes into play, and so CAGW slows the earth! BTW there seems to be an error in someone’s calculations. If the day, 300M years ago, was about 21 hours long then the year would be 365 x 24 /21 days long. This is about 417 days, not 450 days. The implication is that if the year was indeed 450 days long, the earth was in a different orbit, rather father out. Hence the earth must be spiralling into the sun. Once again, blame tidal friction. But if the earth is spiralling into the sun as a result of tidal friction, why is the moon spiralling out from the earth dud to tidal friction. Of course, my calculations could be wrong? Hear, hear, and really just to name a few of the known “randomizing” elements. The biggest failure of imagination of all is that education always seems to put the cart before the horse. It starts with the definition of quasi-“constants”, here is the length of a day, a year, the orbit of this planet and that, etc, so that the student’s understanding comes from the opposite end of the logical spectrum. These quasi-constants are mere observations, snapshots of the sum of countless influences that total up to yield the current state of the observed universe. In reality the whole thing is as close to a random number generator as is possible, it is truly chaotic if we can just detach ourselves from our narcissistic point of view. Every passing comet and asteroid and interstellar event ( perhaps even inter-galactic event ), every new star, nova, supernova, even every change of radiative output of any and all stars will affect something. That is all on a huge macro scale which likely dwarfs the local climatic micro scale that we all obsess over every day. You know how we have those astronomy models that show the positions of planets back into the past and forward into the future? Now try accounting for all the randomizing chaotic events that occur in real life out there. One glance at the surface of the moon should demonstrate that the influences that resulted in our current position and orbit, and length of day, etc, is truly unmanageable from a predictability point of view. Any model that says for example: ‘in 3975 years this is where Jupiter will be and this is where our moon will be’ should be accompanied by a disclaimer: ‘in 3975 years this is our best guess where we believe Jupiter will be and this is where our moon will be’. Now tell me again how weather and climate models work? They can’t work because they are constantly being rendered useless by discounted and unaccounted for variables on our tiny little ball of magma, dirt and water. It is like cooking up an Irish stew and predicting where the bubbles will appear and where the solid food will settle. Good luck with that. The Earth’s orbit should increase with time as the sun loses mass. It means little in outcomes, but I derive comfort from equating the state of the globe’s temperature to the state of a human body temperature. Each object has multiple influences that can and do affect temperature. There are cycles, but the lengths of the cycles need not be related (think rate of respiration with rate of sleeping with pulse rate. Maybe rough correlations exist some of the time, but nothing you could model well). It’s interesting philosophy to discard the constants as primary assumptions, then to do observations with adequate accuracy to derive constants or quasi constants. I’ve often wondered why so many physical equations (before relativity) ended up with exact powers, given that Nature is not supposed to be able to count 1, 2, 3, etc. And in fairness I should admit that I nicked that idea from Wellington in “The Perishers”. That’s an interesting observation. Before the Cambrian Explosion (a little more than a half billion years ago), life on Earth was just a bunch of single cells and algae, not something that couldn’t survive a rapidly spinning Earth with wild tides. But the algae started over 3 billion years ago. There must have been other factors that neutralized some of the energy transfer. scarletmacaw misses the heart of the dilemma. Forget what “life” was like 3 billion years ago. Geologists tell us that some geologic formations date back 4 billion or more years. But no surface formation could withstand repetitive many-mile-high tidal waves beating at them every few hours. Conclusion: either geologists’ time measurements are way off, or the moon wasn’t around to be that close to the earth. Either way, it raises many more problems. Not really new, JPL and Potsdam have papers on the subject. Now, that should shake geo-solar science from its current slumber. it is hard to see how the earth could generate a magnetic field without the sun. Everyone likes to think the molten core is the explanation, but that ignores the chicken and the egg problem, as well as the magnetic properties of iron as it is heated. I would have thought that it was the ratio betwen the two that mattered. And if Earth can leave just a little more of its mass in the great mass deposit bank that is the SUn, then it wil be much lighter on any later jouneys outwards. The earth rotation is causing the winds to blow, not the other way around. The earth and it;s atmosphere move freely and frictionless through the vacume of space.,The only influence on the speed of rotation is the spread of the mass within the earth, over it’s surface or within the earth moon system. Ocean currents may influence this, wind currents in much lesser values (more air mass around the equator should make a difference and may be you could measure that), but winds slowing down the earth rotation is a cause and effect swap, sorry. The period of global cooling in the 1960s/70s and the period of warming from the mid 1970s to the late 1990s was predicted by the distinguished scientists, Kurt Lambeck (Australian) and Amy Cazenave (French) (see here: http://tinyurl.com/l5turxx, http://fr.wikipedia.org/wiki/Anny_Cazenave and here http://en.wikipedia.org/wiki/Kurt_Lambeck ) in 1976 using decadal plus variations in the earth’s rotation as the independent variable. There are well established, close relationships between the long-term fluctuations in the Earth’s rotation, on the one hand, and the variations in the ice sheet in Antarctica, epochs of atmospheric circulation, global air temperature, regional precipitation and cloudiness, and even in the catches of food fish in the Pacific Ocean, on the other. Lambeck and Cazenave (1976), “Long Term Variations in the Length of Day and Climatic Change” published in 1976 in the Geophysical Journal of the Royal Astronomical Society Vol 26 Issue No 3 pps 555 to 573, were the first to report evidence that established the relationship between the Earth’s decadal variable rotation and climate dynamics. As LoD shortens, (i.e. the Earth rotates faster) the planet warms; in contrast, as LoD lengthens, (i.e. the Earth rotates slower) the planet cools. There is a time lag of between six and fifteen years between changes in the Earth’s rotation and global temperature. Their paper warrants careful study. These findings have been corroborated by more recent similarly high quality papers. There is a substantial literature about relationships between decadal and longer changes in the Earth’s rotation and climate dynamics. Lambeck and Cazenave (1976) provide a broad overview of how decadal rotation variations over the period 1800 to 1950 change ocean/atmospheric oscillations and thereby global and regional climates using results reported by Horace Lamb in his 1972 treatise, Climate, present, past and future. Observations of climatic fluctuations during the last two centuries show two principal types of atmospheric circulation alternating typically every 20 – 40 years. The first type (type I) is characterized by an increasing intensity of the zonal circulation at all latitudes and with a poleward migration of the belts of maximum wind intensities. The circulation is accompanied by a decrease in the overall range of surface-air temperatures between the equator and the poles, and by an overall increase in the mean global surface-air temperatures. Ocean-surface temperatures also tend to increase at high latitudes. The type II circulation is characterized by a weakening of the zonal circulation, by a migration of the main streams to lower latitudes and by an overall decrease in temperature. For both types of circulation the migration in latitude and the changing intensities are global phenomena, occurring at all longitudes and in the northern and southern hemispheres although the trends in different regions are not always in phase. Both easterly and westerly winds increase with the type I circulation and both decrease during the type II circulation. Sidorenkov (2009) updated these patterns considerably, drawing on an extensive literature. Sidorenkov (2009) concluded that because long-term variations in LoD can now be determined with great accuracy, the many-year findings he and others have documented show that the long-term variations in LoD present a unique nature-born integral index of the global climate changes. Everything is a cause and effect swap. Downwards to ‘thermal ground’ anyway..
Arbab (2009) found an empirical law for the variation of the length of the Earth’s day to increase at 0.002 sec/century (present rate). He found the length of the day found to be 6 hours when the Earth formed. For most of Earth’s life day length has been shorter than 14 hours! Talk about linear extrapolations! Anyone like to speculate on the shape of the newly-forming “Earth” if it were rotating every six hours? Maybe the Earth WAS flat, after all! Apparently Cesium atomic clocks aren’t accurate enough, losing 1 second in a 100 million years or so. So now atomic clock are being mad that are 3 times more accurate. At the current rate of stupidity and war, I am not sure the human race will be worried about losing 1 second in ~100 million years! If we can get a better ‘level surface’ with which to survey the future you object? Without enquiry first? It’s those bloody models again !!! There is a relatively large gravitational interaction between the moon and the earth but with the moon moving further, and further away that interactio is diminishing. RichardLH has it backward. In order to move from a lower to a higher orbit the moon must gain energy, which it gets from the earth’s rotation. The farther away it gets, the less energy is transferred, so the process gets slower. The moon is not on some parabolic trajectory losing energy from some remote “brush with earth”. Another factor not mentioned above is polar ice. the more ice at the poles the faster the earth rotates. I would expect this to be more effective than core changes which would be very slow compared to earth’s rotation and have little effect. Factors effecting Earth’s Climate ae well as LOD. 1. Moon having left Earth’s influence is the true, ‘thermal ground state’ of the Earth. 2. Until then all the energy stored in orbit by the Moon is here on Eearth some-how. 3. Leaking away down that long thermal slope to zero. 4. With top-ups from the slightly varying Sun. Was thinking exactly the same thing. Periods of increase in rotational speed (or reduction in the slowdown of rotational speed) appear to correlate well to periods of rising temperatures. Assuming the earth was spinning much more rapidly aeons ago, we could expect it to be warmer than today, other things being equal. Further study needed, etc, but it’s another variable that matches climate changes much more closely than atmospheric CO2 levels. It’s also another second-order variable that is likely to be influenced by the solar system. I really don’t see much room for CO2 in determining climate other than as a ‘lubricant’, helping to spread heat around the globe more effectively and evenly rather than actually increasing the ‘average’ global temperature in any measurable way. If Venus has a fairly uniform temperature, despite its extremely slow rotation making for very long nights, this would mean I might not necessarily be barking up the wrong tree. Don’t forget that longer days intersect more incoming sunlight, but then comes the night, with some reversals. What are the main differential factors that cause the daytime warming of planets to be at a different rate to the night time cooling? The earth-moon orbital system is changing. As the tides create friction on the earth from moving the air, sea, and land (yes, the land is moved by the tides, too), energy is lost from the earth-moon system. Angular momentum must still be conserved. This occurs by transferring angular momentum to the moon, raising its orbital distance from the earth, while slowing the spin of the earth (reducing its angular momentum AND rotational energy. The tides will stop when the earth’s rotation slows so much that it always keeps one face towards the moon. That event is MANY millions of years away. By my calculations, the day and the month will both be about 1100 hours (about 45-46 days) long, as we currently measure time. …and other slight changes in characteristics such as earths overall diameter and mass. Imagine a flatter earth would spin faster than one with high continents. As we collect space junk, our masses increases. More idiocy that tries to measure things that are smaller than the margin of error. For every slowdown in the Earth’s rotation due to wind pushing on mountains, a meteorite impact on the Earth (or within it’s atmosphere) may speed it up, again. Or maybe an impact will add to the rate of slowing. Does this guy pretend to know all the impacts of the impacts (sorry)? How about friction of the atmosphere with the solar winds? Does he know how internal friction with the molten core and magnetic interactions influence the rate of rotation? And as another poster suggested, does he negate or ignore the impacts of tidal forces from (primarily) the moon and other planets? More important than those questions are these: are our research universities facing a crisis of idiocy? Do we have too many people doing worthless science to get worthless science degrees, just because they cannot think of how to either make a living (or contribute to society) in a more productive manner? Does a Spin–Orbit Coupling Between the Sun and the Jovian Planets Govern the Solar Cycle? Publications of the Astronomical Society of Australia, 2008, 25, 85-93. Link to K. Lambeck and A. Cazenave Long Term Variations in the Length of Day and Climatic Change Geophysical Journal of the Royal Astronomical Society, (1976) 46, 555-573. I recently made similar runs using my artificial neural networks for SOI and LOD indices. But for better result I also included the solar wind, the Kp index and the Ap index. However I very much doubt that the planets or the barycenter has anything to do with Earth rotation or ENSO. Why the connection with the magnetic indices and the solar wind? which gave me a wow impression. And here is the graph for LOD. Note that the first part between 1997 to the end of 2004 is the training part and the part from 2005 onward is the test part. So the graph in itself is not made as a prediction. Still the correlation at the test part is impressive. Next I am going to do the same for the NINO3.4 index. I have now after I have analyzed the TAO buoys for the sea current values a much better understanding how the tides drives the ENSO phenomenon than before. Sorry II mixed up the LOD and SOI. Just change the order. Any chance you can extract some sort of matrix from your network that could be reduced to a conventional math model? 1) While distinguishing between frequencies of LOD variation is critical, the first, most important determination is whether the process is reversible or irreversible. Both processes are mixed at frequencies across much of the spectrum. 2) The single irreversible process is tidal braking, but this varies in periods ranging from lunar cycles to eons, the former including primarily: a) lunar/solar phase (full moon, etc. ); b) lunar perigee/apogee; c) angle of lunar orbit to the ecliptic. 3) Over the eons and shorter periods tidal braking varies according to: a) the irreversibly increasing distance of the moon; b) the configuration of the continents (Pangea had comparatively little coastline); c) sea level (high sea level reduces land area and coastline). 4) Reversible processes include those shown in Vucevic’s link, and vary in frequency from the instantaneous (which of course cannot be measured) to ice age frequency. These processes (atmospheric and ocean coupling, core/mantle coupling, ground ice melting with associated eustatic sea level rise, steric SLR, post glacial rebound, etc.) entail variation of angular momentum within the lithosphere/cryosphere or between the lithosphere, hydrosphere, and atmosphere (all reversibly), and impart no angular momentum to the moon’s orbit or to the earth’s orbital energy. 6) Accordingly LOD data detail a combination of reversible and irreversible processes so that good data interpretation requires first a sorting out of causal processes of overlapping frequency. Lots of good work has been done toward attribution of LOD measurement, and a whole lot of junk science has been done, some of which shows up at WUWT. 7) LOD may be correlated to eustatic SLR at a rate of about 0.1ms/cm. This is of course of the reversible sort, and it places constraints on ice mass balance taking into account the uncertainty of the contribution of core/mantle coupling. It should be noticed that this is three orders of magnitude greater than contributions due to steric SLR or long term increase in atmospheric angular momentum due to rising T. Of course there are are competing processes with opposing contributions to LOD, but on the whole warming melts ice which increases LOD. Since we see no such increase, the minute SLR observed must be attributed to thermal expansion (steric SLR). 8) ENSO involves enormous energy, which is radiated to space irreversibly. Accordingly any tidal contribution to ocean heating of any type is constrained by the measured rate of decrease of the earth’s kinetic energy of rotation, equal to the displacement of the moon’s orbit plus the solar contribution to tidal braking. This amounts to an increase of the whole ocean of 2 thousandths of a degree per century. It is thus impossible to attribute ENSO to the moon. 9) Whereas tide oscillations do drive small ocean currents, some slight heat transport may turn out to be measurably correlated to tide intensity as governed by lunar orbital parameters. The centripetal acceleration that keeps the Earth in it’s orbit, decreases as the sun’s mass decreases, and the sun is continually losing mass through the solar wind, as well as converting mass to energy. At any given instant, the Earth’s velocity is slightly too fast to counterbalance the acceleration, so there’s a net velocity component that increases the Earth’s orbit over time. This is a very small effect. Assuming a constant solar wind, it would have increased the Earth’s orbit less than 1% over the age of the solar system. It is obvious that the ENSO (i.e. El Nino/La Nina events) is not being energised by the Moon (i.e. Lunar/Solar tides). No one with any skerrick of scientific literacy would claim this is the case. This is just a smoke-screen to divert the intellectually timid. However, even a junior high student student can tell you that it is possible for the energies produced by a massive steam engine to be governed by a small control valve. Note how he sets himself up as the arbiter as to what is “good work” about LOD measurements and what he believes is “junk science”. This is just an absurd appeal to [self-appointed] authority, rather than using evidence to back your case. I let the reader decide who is actually pushing the junk science in this case. I have some problems with the 450 days of 21 hours compared with the approximately 365.25 days of 24 hours we experience now. Everything I’ve seen in the past indicates that the Earth is (slowly) moving into a higher — and thus longer — orbit around the Sun, just as the Moon is doing in regards to Earth. Yet these figures would have Earth experience a year of about 9450 hours 300MYA compared with our current value of around 8766. But since the length of a day has no bearing on the total number of hours in a year that seems like an exactly backward relationship to me. I could have easily believe a figure of 400 or 410 days of 21 hours, since that would be a shorter overall year but 450 I do have problems with. Where is my understanding going wrong? Are you aware of the following paper? A. Without deep mixing, in a few thousand years, the Earth’s oceans would turn into a stagnant pool of cold salty water. B. Hence, the Earth to Pole heat flux of 2000 Terra-watts associated with the meridional overturning circulation [of the oceans] would not exist without the comparatively minute mechanical mixing sources [i.e. deep water mixing]. C. 2.1 Terra-watts are required to maintain the global [oceanic] abyssal density distribution against 30 Servdrups of deep water formation. D. Of the 3.7 Terra-watts of power provided by [Lunar] tidal dissipation in the Earth’s oceans, as much as 1 Terra-watt could be available for deep water mixing. E. The winds (~ 1 TW) and [Lunar] tidal dissipation (~ 1 TW) are the only possible source of mechanical energy that can drive the deep mixing of the oceans. These numbers have been revised (downward) since this seminal publication but the basic argument still stands. I think that the slight heat transport that you are referring to is technically called CLIMATE on millennial to decadal time scales. .
And Munk’s paper never mentions ENSO. It seems IW is pressing wine from raisins. Symposium in Melbourne on June 17th 2009. Don’t sweat it too much. The fellow by the screen name agfosterjr has shown many times in the past that he does not understand the dynamics of energy storage and release or resonance phenomena in general. I think SST would be the most desirable link between tides and ENSO. Thank you agfosterjr for your openness to further inquiry. I may have unfairly misjudged your earlier comments. Sorry. This skat is as important as a nit on a gnats nut—relatively speaking. Interesting proposition! Imagine the earth-moon system viewed by an observer above the North Pole. The earth rotates anti-clockwise (all points heading east). The moon does not really rotate around the earth, we are in a “two planet in the same orbit” system. Before jumping up and down, note that the moon’s orbit, like the earth’s, is always concave to the sun. When the moon is outside the earth, it is farther from the sun and its orbital speed is less than the earth’s, so the earth overtakes the moon. Gravitational pull of the earth then attracts the moon into a lower orbit, and accelerates it, so that the moon, after passing behind the earth, then overtakes the earth. The earth’s pull then attracts the moon out again, and slows it, so the moon crosses the earth’s orbit ahead of the earth, and eventually the earth overtakes the moon again. And so on ad infinitum, or nearly. But note: to that heroic observer, the moon is in a clockwise orbit relative to the earth. If the earth then turns one face to the moon, it means that the earth will have had to change its rotation from anti-clockwise to clockwise. Are there errors here? Perhaps, but it seems sound to me. Janus, distance to Saturn 151 472 km, diameter 179 km, orbital period 0.696 days. As they are at slightly different distances, Epimetheus on the inner orbit overtakes Janus – it can’t pass it as their combined radii (146 km) is greater than the difference in orbital distances (50 km). uh, tad, you must be reading “modern” science books. Don’t be fooled. The Earth cannot transfer angular momentum to the Moon. You have been taught that the Moon rotates on its axis, I guess…. Oh, please, geran! The moon does rotate (slowly) on its axis. The moon also has angular momentum as measured from the earth (and from the sun, for that matter). Conservation of angular momentum is merely a special case of conservation of energy. You do have that in your physics books, don’t you? As the earth passes energy to the moon, to put it into a higher orbit, it can be measured as a change in angular momentum (in the earth-centered system) of both earth and moon. Yes, and the length seems very similar. And when the earths spin slows down the water will be pushed mainly eastwards because of its inerta, and the top effect will be when deceleration stops and a new acceleration starts. And in combination with the regular ocean currents, hmm.. Since you said “please”, I will try to help. There are other errors and misconceptions in your comment, but first it is important you understand this simple point. It gets more complicated from here. If your horse starts heading east, then turns left and heads north, then left again and heads west, then turns again and heads south, then finally ends up heading east again, the horse has rotated once, even if the rotation is spread out over a full race track. You might not like Wikipaedia, but if you posted there that the moon does not rotate you would be shot down smartish! Ah, geran, but a viewer above the plane of the moon’s orbit notices that the moon must spin completely around once every 28 days or so to keep it’s same face toward the earth. A horse making, essentially, four left turns (or right turns in England) does wind up turning 360 degrees. Explain, please, when is a rotation not a rotation. Always open to correction of “errors and misconceptions”. Hate to think that my professional calculations of missile and satellite paths were wrong. Exactly my point Dudley, “institutional” science is wrong in several areas, AGW, is only one such area. The Moon is so simple and straight forward that it is a perfect example. The difference is the horse is NOT rotating on its axis, nor is the Moon. If you are claiming that “rotation on an axis” does not occur unless the object is stationary, then you have a weird definition of rotation. By that measure, the earth does not “rotate” because while it is “spinning” it is also moving along its orbit around the sun, just as the moon moves along its orbit around the earth. Geran, to put it another way, if I told my buddies that their spy satellites did not have to “rotate on their axes once per revolution” to keep their camera’s pointed toward the ground, I would have been booted off the project. If you really believe I have made such a claim, then your imagination is working REALLY well. So, try to imagine that what you see is what it is. The horse is NOT rotating on its axis, nor is the Moon. So, intimidation means you are not free to think for yourself? Just curious, does anyone have the calculation for how many joules of energy is being transferred when the Earth speeds up or slows down one millisecond? When the moon is outside the earth, it is farther from the sun and its orbital speed is less than the earth’s, so the earth overtakes the moon. Let’s test your statement with some observations. When the waning moon is past its last quarter we can often see it rising in the east in the pre-dawn sky ahead of sunrise. In this case, from my northern hemisphere perspective, the moon is located to the right of the sun. At new moon the moon is closer to the sun than the earth. After new moon we see the waxing crescent moon in the western sky after sunset, now located to the left of the set sun. So this series of observations tells us that the new moon passes from right to left across the daytime sunlit sky. At the time of the eclipse the moon shadow passed from the west over the Atlantic Ocean eastwards across the sunlit Sahara Desert towards the eastern horizon. So the direction of the shadow’s motion is from right to left for a ground based northern hemisphere eclipse observer. We know that the earth is further from the sun at the time off a solar eclipse. The earth is therefore overtaking the moon shadow. The only way this can occur is for the earth to be orbiting the sun faster than the moon when the earth is furthest from the sun. A moment’s reflection will show that this is also true for the moon. At the time of full moon it is orbiting the sun faster than the earth even though it is further away. You have a fundamental misunderstanding. We never see the “left side of the horse”, i.e., the “dark side of the Moon”. The Moon always shows us the same face. Look at it over a month’s time. No matter where you see it, you will always see the Man in the Moon. The Moon is tidally locked. It rotates at essentially the same rate as it revolves around the Earth. And yes, the Earth can influence both the orbital angular momentum and the spin angular momentum of the Moon because both bodies are non-rigid. Bart, ever been to a horse race? How about a track meet? Same principle. Or, you can carry out this experiment on your living room floor. It is not a hard concept. (Use an orange for the Earth and a pencil, or other pointed object, (please be very careful with pointed objects….) to represent the Moon. No expensive test equipment involved, but you have to use your brain. Try this, geran. Suppose the jockey is holding a compass. As he rounds the track, is the needle going to A) stay fixed or B) rotate 360 degrees? In your reality, you would choose (A). That is incorrect. Anyway, sorry I got involved. I should know by now that you cannot reason someone out of something they have not been reasoned into. Hasta la vista, geran. Philip M– dudley may be mathematically challenged, but wouldn’t it be easier to just say “At the time of a full moon the moon’s earth-orbit velocity vector is added to the earth’s orbital velocity, while at new moon, it is subtracted.”? I understand, but please hang in there. I think you may be about to see it. As you moved around the orange, you were turning the pencil, not rotating it on its axis. This is just the same as the race horse of race car. Also, try this. Assume the orange is the middle of a clock face. Start with the pencil at the “3:00” position. Position one finger at middle of the pencil. Your finger will represent the axis of rotation. Without advancing the pencil around the clock, rotate the pencil 360 degrees. You will notice that the orange “sees” all sides of the pencil during a full rotation. If the Moon were rotating on its axis, instead of turning, we would see all sides of the Moon, which we do not. The earth’s kinetic energy of rotation is 2.138 x 10^29 J. A sidereal day is 86164 seconds. So (2.138 x 10^29J x 2) / (86164 x 1000) = 4.96 x 10^21 J.
Ian Wilson: and I should never say never. Are you somehow trying to somewhat agree with me, or just confused? Where did you ever get the idea that I have defined “rotation”? I have been using the term “rotates on its axis”. “Diurnal Time Variations” sounds more scientific to me. Copernicus. If you seriously don’t believe this there’s a flat earth society waiting for your membership. Consensus will elect a prom king/queen. and let’s see—is the flat earth society about continuing to believe things that can be so easily disproved?? Definitions certainly are a matter of consensus. You can’t make up your own. If you have a private philosophy consisting of idiosyncratic definitions you will have a hard time communicating. Wheels rotate/spin/revolve about an axle/axis. Whether a wheel has an axle or not, it does have an axis, a center of rotation, which is motionless relative to a perspective stationary relative to the (circumference of) the spinning object (if it is round). A bicycle wheel has an axis of rotation whether it’s spinning over the ground or in a bike shop. A motorcycle wheel has an axis of rotation anywhere it goes, including inside a circus cage cylinder. Assume two gears of equal size, one fastened to a table top, the second spinning around it. Does the second gear rotate or not? Does it revolve or not. Does it not rotate around its center? Does not the moon? I know I have won the debate when they go off on rambling tangents…. So the moon doesn’t rotate, it turns? It doesn’t rotate on its axis, it turns on its axis? So the moon doesn’t rotate, it turns? There appears to be some progress! Yes, the Moon is turning in its orbit, just as the race horse on an oval track. It is NOT rotating on its axis. There are two different motions here. For example, walk in a circle (orbit). Someone standing inside the orbit would see the same side of you. Next try walking the same orbit, while spinning on your axis. The person standing inside the orbit would then see different sides of you. That is why the Moon “rotating on its axis” is easily disproved. AGF– You have finally plumbed the depths (?) of G’s thought process. He reserves the phrase “rotates on its axis” for situations in which the axis itself is completely stationary. Like Humpty Dumpty, the phrase means only what he wants it to mean “neither more nor less”. But, of course, nothing in the universe is completely stationary– everything being subject to multiple simultaneous motions — therefore his use of the phrase is completely arbitrary. Here’s another angle. If an object spins, does not every point on the object spin? Suppose you you stand in the middle of a merry-go-round and see children holding on near the perimeter. If you stand still you don’t have to turn your head to watch them steadily, while you would have to turn your head to look at someone standing on the ground. Now you might think it redundant to say the children are both revolving and rotating, but you must admit that you and they are rotating together, while the children experience centrifugal force which you do not because they are also “revolving” at some distance from the center. Does that make sense? Maybe not. We could just as well say the centrifugal force was due to the rotation, in which case it is in fact redundant to say every point on the disc except the center both spins and revolves. OK, I think I see your point now. But the fact remains that every point on the disc does revolve around the center, and does rotate relative to the non-disc universe. So you would say that the fact that the moon experiences day and night over a synodic month follows from its revolution, not some separate rotation apart from its revolution. But this just gets us back to convention and consensus. Since Newton, physicists have defined rotation according to a sidereal or inertial reference frame. And you must admit that for the moon to experience phases–day and night–it must rotate relative to the sun. And if it rotates relative to the sun it must do so about an axis of rotation. The moon must have a north and south pole from which the sun appears to revolve around the horizon, just like on earth. And we don’t care if it wobbles–the earth’s axis wobbles too. You may need to try the “orange/pencil” experiment again. No amount of rhetoric can replace the facts.